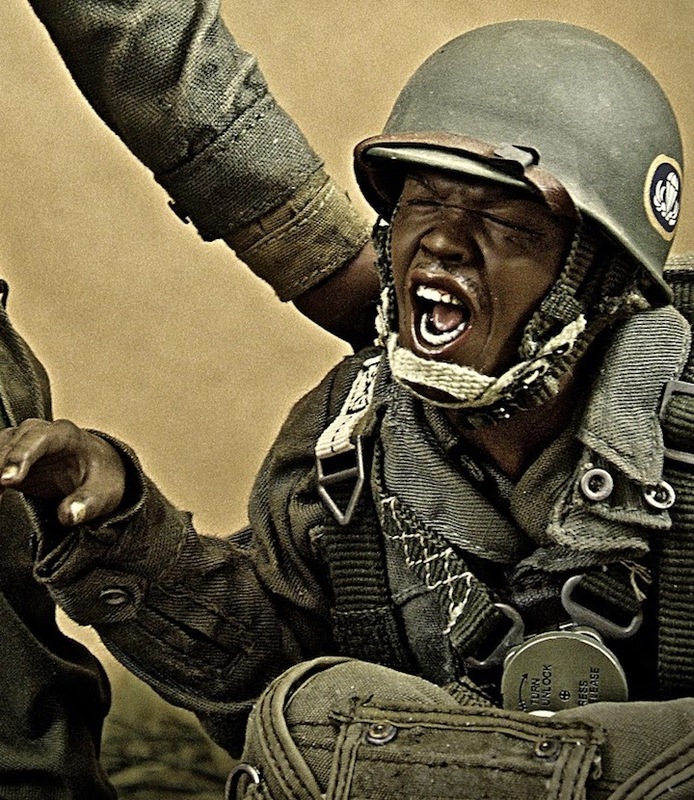 Bring it On— In a stunning display of 1:6 scale artistry, customizer Miguel Tavares has recreated a battle scene from the Korean War featuring two figures from the U.S. Army’s 2nd Ranger Inf. Co. (Airborne). 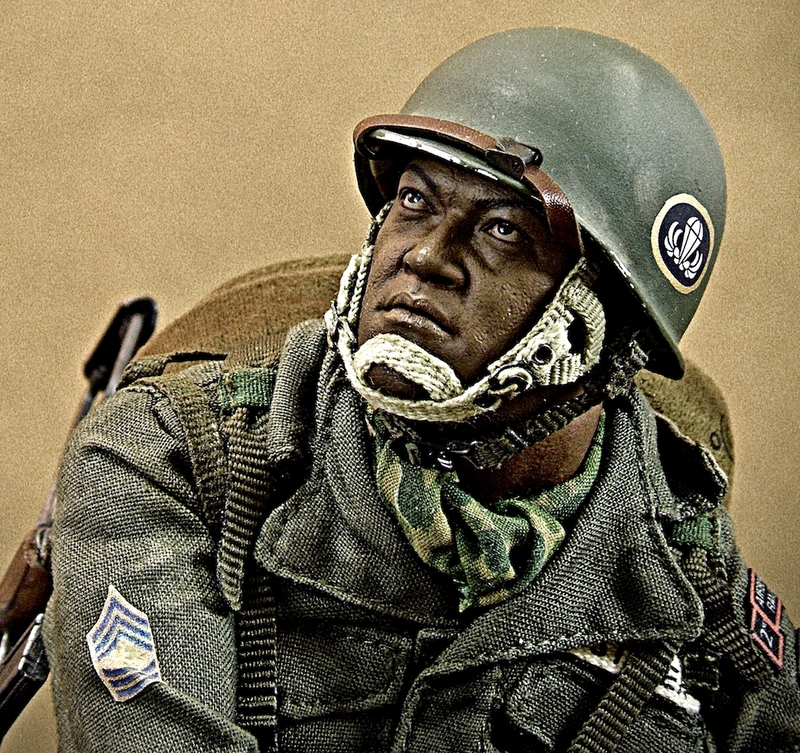 This closeup of the Master Sergeant reveals he has been authentically detailed with correct unit insignia and helmet emblems produced by Patches of Pride. (Photo: Miguel Tavares) Click to enlarge. Welcome to 2017, 1:6 Scalers! It’s a brand-new year and the guys and gals at The Joe Report felt like kicking things off with a BIG photo-story about a new, rising talent among the 1:6 scale customizing community—Miguel Tavarez. Tavares is a master modeler and 1:6 customizer of the highest degree, and in recognition of his superlative skills, the UK hobby magazine Military Modelling recently published an article about his work, even going so far as to feature a photo of his new (2-figure) paratrooper diorama on the publication’s cover. 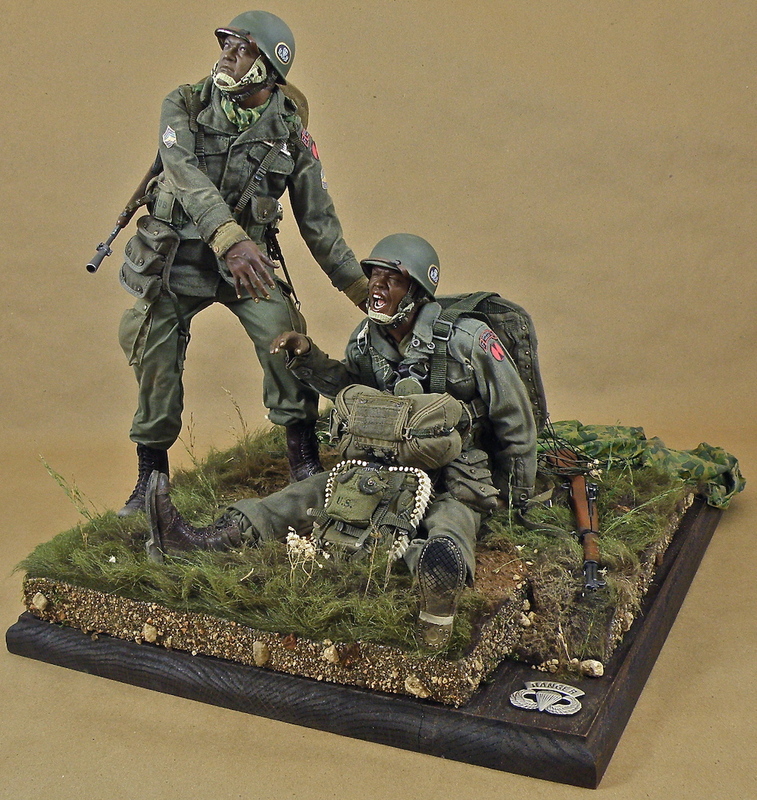 The remarkable diorama in question depicts two African-American U.S. Army paratroopers of the 2nd Ranger Infantry Company (Airborne) during the Korean War. They’ve just completed a jump and one soldier appears to have suffered a hard landing or been otherwise wounded. His Master Sergeant has rushed to his side, all the while gazing grimly skyward as he watches other Rangers still descending. This 1:6 scale masterwork is both wonderful and inspirational to behold. Action figure customizers and diorama builders around the world would probably pay good money just to take a 1 hour class from this talented artisan. If fact, we felt Miguel’s Ranger dio achievement was so important, that it was worthy of further mention and praise beyond just the pages of a UK hobby magazine. Therefore, despite any repetition, we’ve wholeheartedly chosen to share it here, too—on The Joe Report! A Bad Time for a Sprain— What a superb choice of headsculpt! This figure’s excellent facial expression perfectly captures so much emotion at once. The frustration, pain, and yes, even anger, at being hurt before even getting to fire a shot, must surely be a severe disappointment to this Ranger. After training for months, making dozens of practice jumps, and going through everything required to become a U.S. Army Ranger, to be sidelined and/or hobbled like must be quite a blow. Let’s hope this brave paratrooper’s leg is only sprained and not broken. Go, Rangers! Go, ARMY! (Photo: Miguel Tavarez) Click to enlarge. When you study Miguel’s custom figures, you quickly discover that he is zealously devoted to both military accuracy and authenticity, as well as the execution of professional, almost extreme modeling detail. Take a (very close) look at those hands (the fingernails! ), the figure’s wrinkled and “weathered” uniforms, their weaponry, equipment, and even the stones and grass on the ground cover beneath their feet—it’s all been magnificently painted and otherwise realistically executed. HISTORY—has been brought back to life in three dimensions: visibly, tactilely—and in miniature! As Real as it Gets— The mind boggles looking at the reality of this ground cover. Make special note of Miguel’s careful selection of the grass and tiny white flowers. Where other customizers would choose or create plantlife that is oversized, Tavarez has ensured that even the tiny flowers are correctly scaled to match his diorama. Un-freakin’ believable! (Photo: Miguel Tavarez) Click to enlarge. Tavarez has also taken the trouble (and expense) to commission custom waterslide decals and cloth patches from renowned miniatures manufacturer, Patches of Pride. All of their tiny products are carefully researched and recreated from scratch, so their inclusion helped to elevate this unique diorama to undisputed “masterpiece” status. Custom works of such high caliber are truly rare, and this one solidifies Miguel’s well-deserved reputation as a master modeler of 1:6 scale. 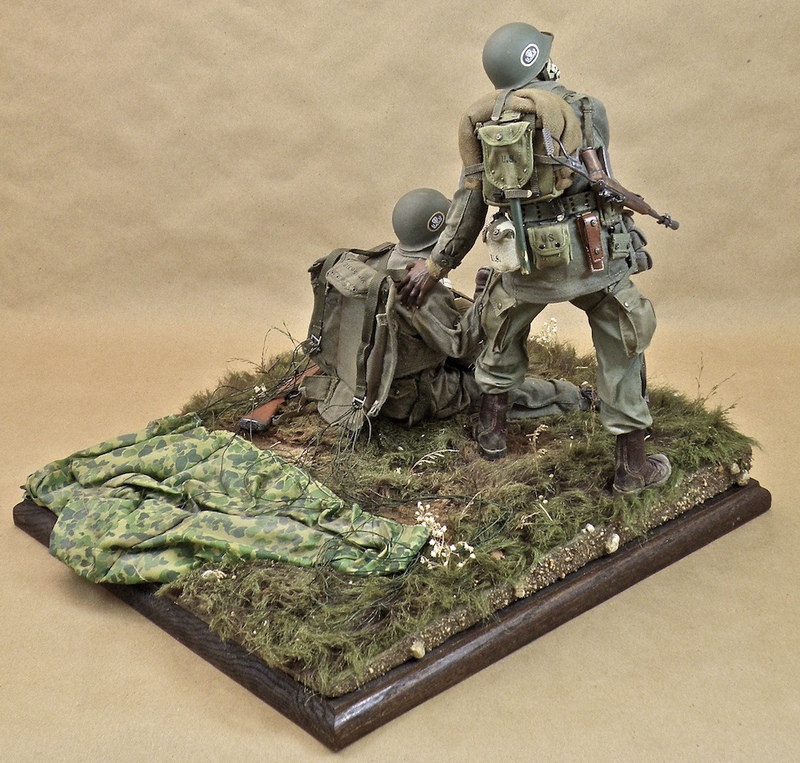 “This diorama is about two African-American Rangers during the Korean War. The Korean War is often referred to as “ the forgotten war” because of the lack of public attention it received both during and after the war, and in relation to the global scale of World War II, which preceded it, and the subsequent angst of the Vietnam War, which succeeded it. After finishing my last 1/6th dio, I was looking for a new project to do, and so I decided to read up on the Korean conflict and see if I could find a subject to recreate within my own little 1/6th scale kitbashing ‘world’. Don’t Forget the Base— Yes, you can simply set your figures on a table, but the creation and use of a custom base beneath their feet helps add geographical texture and context, as well as increasing the realism of your tabletop diorama scene. Beautiful! (Photo: Miguel Tavarez) Click to enlarge. “As I mentioned before, they were an African-American unit at a time when the U.S. military was slowly being integrated after years of racial segregation. President Truman’s executive order 9981 in 1948 changed that. But the reality was that the desegregation policy was yet to come into full compliance. Segregation was still being practiced right into the Korean War. 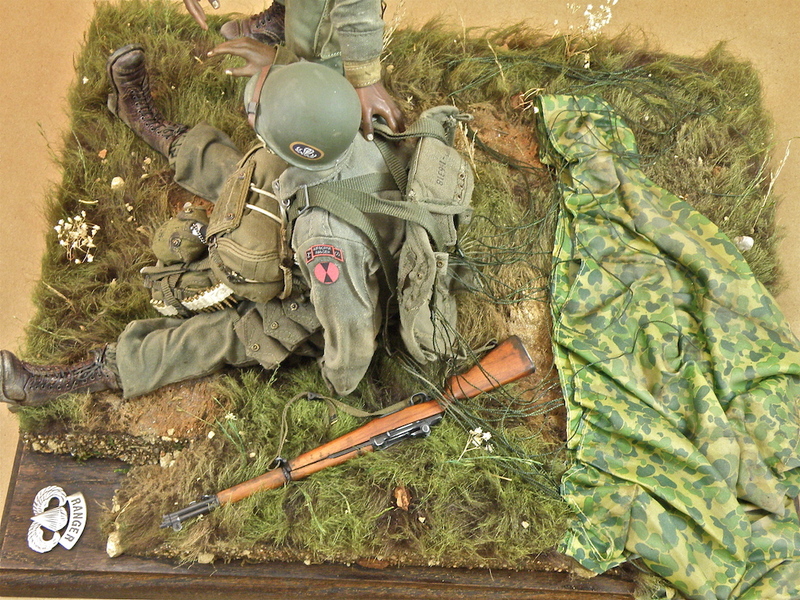 Remembering and Honoring Our Heroes (in 1:6 Scale)— This 3/4 front view shows off the entirety of Miguel’s amazing custom diorama and reveals that he included an actual Ranger pin down in the bottom righthand corner. Congratulations on a great job, Miguel! (Photo: Miguel Tavarez) Click to enlarge. Bottom Line: Miguel’s work is AWESOME. That’s the bottom line. Our sincerest thanks go out to Mr. Tavarez for sharing these photos of his work and for the exclusive account of his inspiration for this piece. As of the date of this article, you could still buy a copy of the issue of UK’s Military Modelling magazine featuring Miguel’s amazing work HERE.